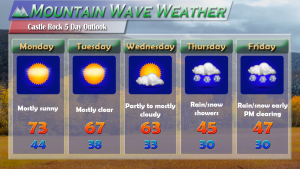 This week’s weather in and around Castle Rock will be a tale of two completely different patterns. 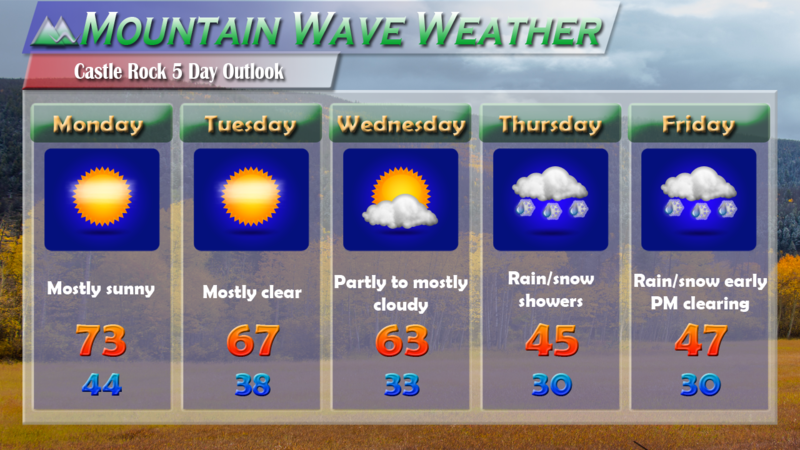 The first half of the week will start out quite nicely with clear skies and warm temperatures. We will begin to slowly cool off towards the middle of the week but temperatures should still remain relatively comfortable in the 60’s during the day. The end of the week has everyone’s attention at the moment; a strong storm system will begin to move into the area late Wednesday into Thursday. Chance of precipitation are pretty good with this one as of our last check on the data, generally in the 70-80% range. There may be enough cold air with this storm that some areas see a rain/snow mix or even all snow! As of right now, we see temperatures just below freezing late Thursday and Friday, no indication of a hard freeze just yet but we will keep a close eye on it through the week in case that changes. Expect a few more posts up this week as we get more data in on this storm system.